"We are what we eat, they say. We can eat what we read, too. 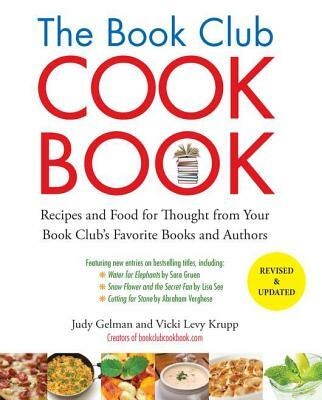 The Book Club Cookbook by Judy Gelman and Vicki Levy Krupp (Tarcher/Penguin, $21.95), first published in 2004 and now newly updated and revised, offers up dozens of new recipes inspired by book clubs’ favorite books, their characters and authors." "It's pretty much a no-brainer why we love something like The Book Club Cookbook - it combines two of our all-time favorite things: food and books. Even better - the recipes in the book let us get a fuller experience of our favorite novels by thinking up recipes either inspired by the story or literally contributed by the author as essential to the book." "The Book Club Cookbook excels at offering book groups new title ideas and a culinary way to spice up their discussions." The Book Club Cookbook will add real flavor to your book club meetings! Judy Gelman and Vicki Levy Krupp are cooks, book enthusiasts, and friends. Seeking to combine their passion for books, food, and book clubs, they met over stacks of books and endless cups of coffee at a local sandwich shop, where The Book Club Cookbook (www.bookclubcookbook.com) was born. They were motivated to write their second book, The Kids’ Book Club Book (www.kidsbookclubbook.com), after librarians, parents, and teachers who attended their talks asked for a similar book for the growing number of youth book clubs across the country. They created bookclubcookbook.com and kidsbookclubbook.com, websites that provide inspiration for book clubs, featuring book recommendations from book groups around the country, author recipes, book giveaways, author blogs, and newsletters. Their latest book, Table of Contents (www.bookclubcookbook.com/book.htm# Table of Contents), features book-related recipes from fifty of today’s most popular authors. Judy and Vicki enjoy speaking about book clubs, and appreciate their ongoing conversations, both in person and via their websites, with book and food enthusiasts across the country. They live with their families in the Boston area.